Hyalogic Joint Logic Hyaluronic Acid Gummy promotes strong joint and cartilage health. This Hyaluronic Acid Gummy is a gluten-free, lightly sugared gummy that helps promote strong joint and cartilage health. Each HA Gummy delivers 60 mg of high molecular weight of HA. 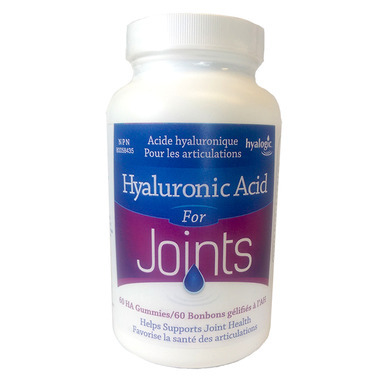 Hyaluronic Acid at 120 mg of HA per dose, Health Canada’s required dosage for making joint health claims. Directions: Take one gummy 2 times per day or as directed by healthcare practitioner. Chew gummy or hold in mouth until dissolved. Natural Color (Purple Carrot Extract, Blueberry Concentrate), Pectin. Caution: If you are pregnant or breastfeeding, consult a healthcare practitioner prior to use. If symptom worsens, consult a healthcare practitioner. Do not use if seal is broken. Keep out of reach of children. Store in a cool dry place. Avoid excessive heat exposure.